It's like having a wedding planner in your pocket. We give you the instructions manual, you put it together and we monitor you along the way. This package is perfect for the bride who has the time and desire to make the phone calls and send the emails to plan her wedding but wants to make sure she's doing everything right along the way. -You'll have 3-5 planning consultations with this package. We'll split the planning up into sections so you can focus on a few at a time and not feel overwhelmed. In short, the first consultation is to create a plan for your entire wedding and provide instructions to carry out that plan. The second and third consultations will be used to receive adjustment recommendations in light of the planning you've done since the first meeting and get your next set of assignments. The last consultation will be after the wedding has been planned in its entirety. This final session will inform us of the plans you've made so that we can prepare for your wedding day. -We begin by gathering details of any progress you've made before retaining us. We'll review all of those details and make recommendations for any adjustments that may be necessary. -A budget estimation will be provided for remaining costs. This will guide you in choosing products and services during your future vendor visits. -All remaining vendor needs will be assessed. You will receive a list of recommendations that fit your budget and style. Knowing that the vendors you are considering are quality and reputable will give you confidence in your selections. -Each category will be discussed, offering guidance and instructions to use during your future vendor meetings. You'll know exactly what to ask for and what to stay away from. 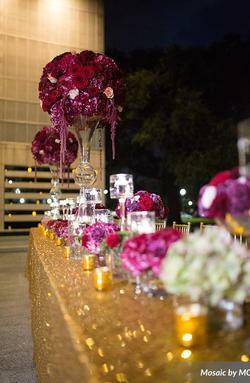 -We will collaborate with you to determine the mood and look of your celebration. From that, we'll recommend vendors and sources for the various items you want to include in your wedding decor if you choose or need to have vendors other than us handle your decor. To ensure that you receive the high level of quality that we demand for all of our events, we put our entire in-house production team at your disposal. Distinctive floral and tabletop designs, luxurious linens, custom graphic design for wall, floor & ceiling treatments, draping and lighting design are some of the services we offer to you as a Gala Productions bride. -We continue to have meetings to review what has already been done and assign what's next until everything has been arranged. At your reception, your only job is to be a new spouse and enjoy yourself. We’ll keep track of the schedule and guide you through each activity. We stay one step ahead of the next big moment to make sure all vendors are in place when you’re ready to shine. 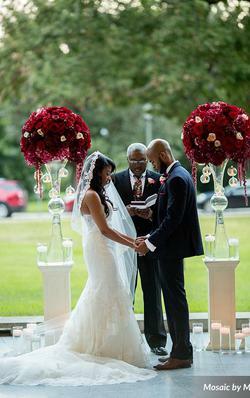 "I want to plan my wedding but I need some guidance and assistance along the way. Then I want full-service day-of coordination at the end."